If you asked a productivity coach for some tips on being even more productive, you’d expect some super cool ninja tactics right? So you can imagine my shock when Jo Bendle gave me a very expected response, when I asked her that question. You’re honestly in for a real treat when you tune into the lively conversation that we had, for this week’s podcast. 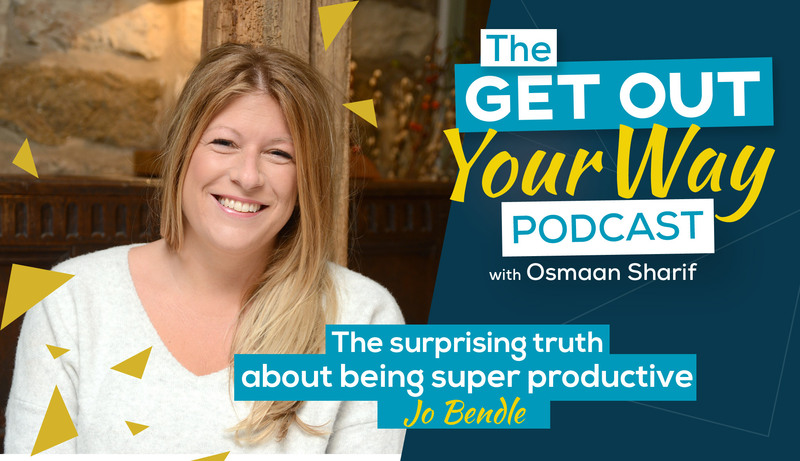 Inside you’ll get to hear how Jo’s business journey has evolved through experimentation & what can happen when you hit a goal that you’ve been striving for. You’ll get to see what the surprising truth is behind truly making things happen & I honestly think you’ll breathe a sigh of relief … because it’s something YOU can do right NOW. Jo also shared a quote that’s zoomed up the charts as being one of my all time favourites now …. so much so that I asked her to share it not just once but twice for you! Instead of thinking …. ‘This sounds great Osmaan, I’ll come back & listen to it at some point’ … do yourself & your business a big favour & tune in right now. As always after listening to it, jump over to the Free Facebook group & share what key actions you’re going to take as a result. * Jo Bendle’s Website & connect with her over on Facebook. Best wishes as always & enjoy taking action. P.S – This episode perfectly compliments the previous podcast episode 006, so enjoy experiencing the amazing results & impact of being super productive.